VillaDirect offers a great management referral program to licensed real estate professionals and also terrific management to their clients. Our program pays you up to $1,000 up-front for each vacation home owner that is sent over that joins our management program. Furthermore, if you have a client that already has property management and you persuade them to transfer to VillaDirect’s program, we’ll also give you the same referral rate. We’ll pay half the referral fee at sign-on and the remaining 50% on the 1st anniversary of them joining. 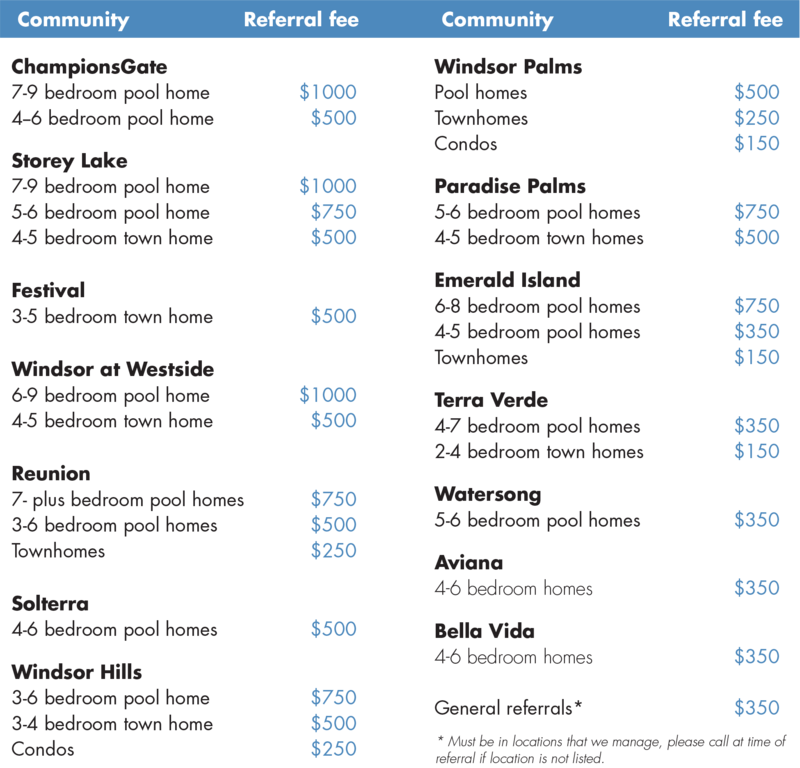 Below, you’ll find a chart outlining the participating communities and the referral rates. Strong relationships are the foundation of any successful referral program. Our partners are our allies, our advocates for building business and as such, have a significant impact on our business. So we believe you’re also critical to our success. Call NOW on (321) 293-8413 or email Team@villadirect.com for more information about this program.